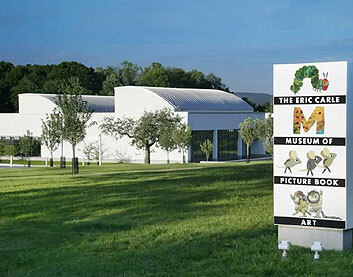 I spent yesterday afternoon at the Eric Carle Museum of Picture Book Art. It’s just up the road in Amherst, sitting on a beautiful spot next to Hampshire College, in the middle of an apple orchard. The architecture of the museum is breathtaking and its contents are lovely. If you’ve never been there, I recommend a trip, with or without kids (and when you go, don’t miss the hands-on art studio). WAMC‘s The Roundtable is broadcasting from the museum this morning– I’m listening while I work right now. Word has it that Carle himself will be on later in the morning. While no longer a Valley resident, Eric Carle’s influence is strong around here. Many people I know have personal and/or professional connections to the museum, the author/artist, and his work. And guess what I just learned? Eric Carle has a blog! (I’m sure at least one of you reading knew this- Hi Meg!) There isn’t much there yet, but even online his words are gentle and his stories sweet. You can check it out here. Have a happy, sunny weekend!